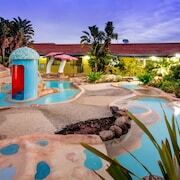 This accomodation is situated in a beautiful location with an easy drive to the vibrant centre of Byron Bay. On The doorstep of bustling Byron Bay this is an exc lent place to relax and 5 mins walk to downtown. 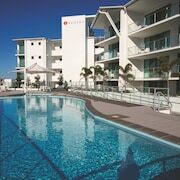 Budget price but very affordable unlike many of the other hotels in the same vicinity to the centre of Byron Bay. Byron Bay has the best beaches, great surf, amazing countryside, a huge amount of cafes & restaurants and a vibe like no other place I know. Discovery Parks is close to the main part of byron bay by car or about a 30min walk depending on how fast you go. 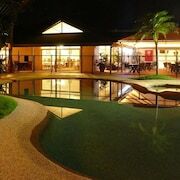 Which hotels are closest to the Byron Bay airport? 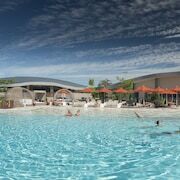 Where to stay near top Byron Bay attractions? 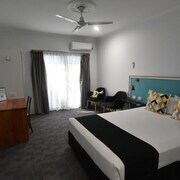 What kind of hotels are in Byron Bay? 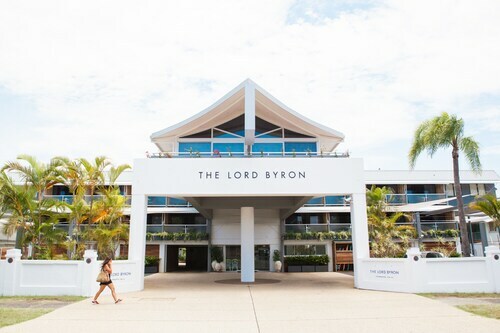 Which hotel chains are in Byron Bay? 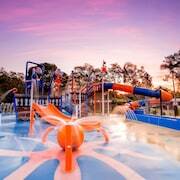 Families will find kid-friendly activities in Byron Bay, and visitors give high marks for the beaches. 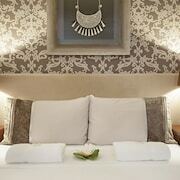 In Byron Bay, there are 313 hotels and other accommodations to choose from. The closest major airport is in Ballina, NSW (BNK-Ballina - Byron Gateway) 22.4 from the city center. The next closest is in Lismore, NSW (LSY) 40.5 away. Cultural venues in the city include Bangalow Historical Museum & Tea Rooms, Brunswick Picture House, and Ballina Naval and Maritime Museum. Favorite family attractions include Macadamia Castle and Crystal Castle & Shambhala Gardens. The city's natural setting is picturesque, including the beaches and these places to visit: Main Beach, Arakwal National Park, and Belongil Beach. Beach Suites - This 4.5-star apartment features free WiFi, free parking, and concierge services. It's a favorite with Expedia travelers for its beach locale and helpful staff. 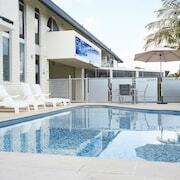 Brunswick Heads Motel - Our customers like the pool and clean, comfortable rooms at this motel. 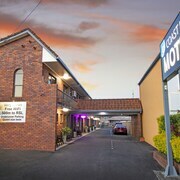 With a stay at this 3-star motel, guests can enjoy access to an outdoor pool and free parking, along with free WiFi. 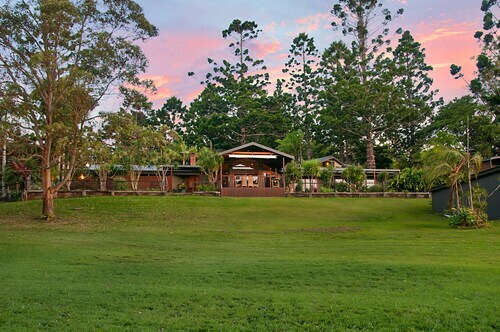 Byron Bay Farm Cottages - With a stay at this 3.5-star apartment, guests can enjoy access to free parking and laundry facilities, along with an in-room kitchen. 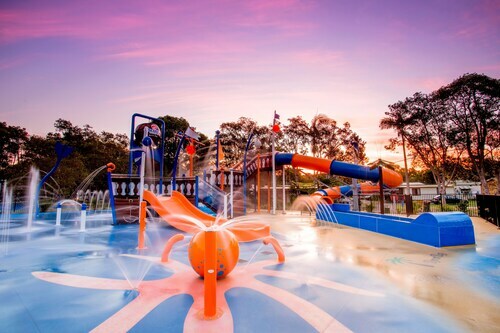 Expedia customers like its family-friendly amenities. If you want to explore the larger area, ride aboard one of the trains from Mullumbimby Station. Byron Bay might not have many public transit options to choose from so consider renting a car to explore the city. Perched at the northern tip of New South Wales, Byron Bay is rich with not just coastal landscape, but also opportunities to get your pulse racing. Take an adventurous mountain biking tour, soak in aerial views of local waterfalls from a gyrocopter, or go on an eco water tour in the Cape Byron Marine Park. Nature is at your fingertips when you holiday in Byron Bay. Of course, the foodie in you can also get its fill at the Byron Bay Community Markets and many award-winning restaurants. Whether you are on holiday as a family, with friends, or on a solo retreat, Byron Bay is an attractive destination. Upon arrival in Byron Bay, it won’t take long for you to reach some of this town’s top attractions. The Byron Bay Lighthouse, which marks the easternmost point of Australia’s mainland, is the area’s most famous landmark. You could drive or take a bus to this beacon, but the scenic route offered by the Cape Byron walking track is arguably the best way to get there. This leisurely journey starts at the Captain Cook Lookout and follows a well-worn path that offers near-continuous views of the coast. The walk will lead you through a teeming rainforest and a blissful beach before concluding on the clifftops at the base of the lighthouse. Along the way, you’ll have the opportunity to witness the resident dolphins, migrating whales, and loads of local creatures. For a glimpse of even more flora and fauna, Nightcap National Park allows an up-close look at the subtropical rain forest. This park also gives you insight into aboriginal life, as Widjabul people resided there for more than 4,000 years. As for surfers, they’ll find no shortage of fantastic waves in Byron Bay. Clarkes Beach is home to “The Pass,” the area’s most popular surf break, while Watego’s Beach is steps away, but separated by a relatively rocky area. Due west of Byron Bay’s downtown area is Belongil Beach, where surfers flock to take on another of the area’s famous breaks, “The Wreck.” Apparel is optional on this beach, though, so you might end up seeing more than you bargained for if you’re heading there to surf. Byron Bay is home to a temperate climate that locals love. Thermometers remain at relatively mild levels most times of the year. In winter months, even the coldest nights are pretty painless, as with seasonal lows still around 11 degrees Celsius. And summers here are never insufferable, as you can expect highs near 28 degrees on the warmest days of the year. Rainfall, however, is fairly frequent throughout the year, taking place an average of nine times per month. Winter and autumn are when the storms are heaviest, while evening showers are quite common in the other seasons. 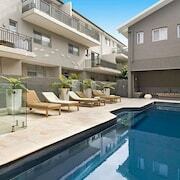 Byron Bay accommodation spans the full spectrum of travel budgets and styles. 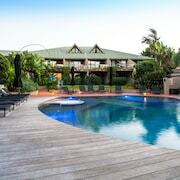 Budget-friendly motels and hotels are a good fit for holidays that won’t break the bank, while Byron Bay luxury accommodation including villas and resorts are ideal for indulgent holidays. 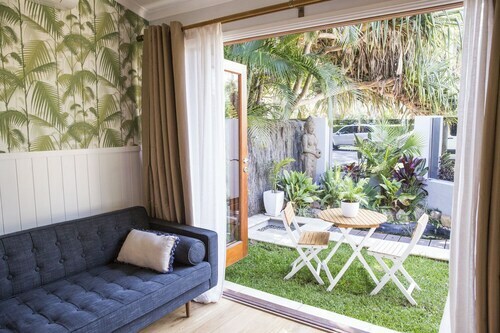 Whether you are seeking upscale accommodation in Byron Bay near the water, or a small full-service apartment off the beaten path, Expedia.com.au has a room for you. 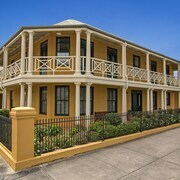 Your ideal accommodation in New South Wales is waiting for you right here on Expedia. 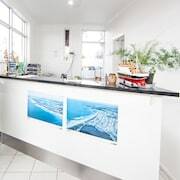 The nearest airport to Byron Bay is the Ballina Byron Gateway Airport (BNK), which is about 30 minutes south of Byron Bay by car. You can also drive to Byron Bay via the scenic Pacific Highway after flying into Brisbane (BNE). When the eastern Australia coast beckons, plan a trip to Byron Bay. From water sports to historic lighthouses, this New South Wales town brings something to the table for every type of traveller. 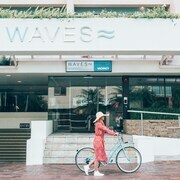 The travel experts at Expedia.com.au have found the best Byron Bay hotels at the best prices, including pet-friendly accommodation and 4-star resorts. Our passion for travel means you always have access to the best accommodation deals, and you can even sort your options by location, theme, and hotel brand before you book. 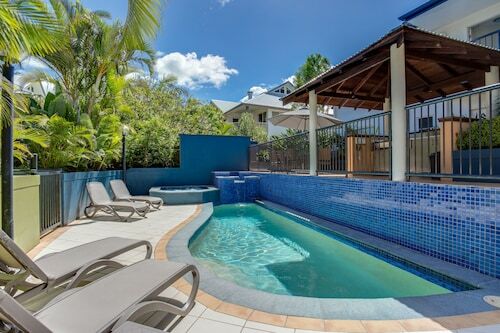 What are the most popular hotels in Byron Bay? Are there hotels in cities near Byron Bay? 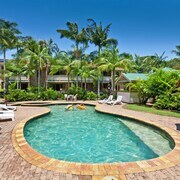 Explore Byron Bay with Expedia.com.au’s Travel Guides to find the best flights, cars, holiday packages and more!